A farm in southwest Minnesota probably is not the first place you'd expect a professional opera and concert singer to call home. Can a singer from Chicago and a farmer from Minnesota find happiness together? Will they bore each other to tears? Will there be a never ending battle over what radio station to tune in, country or classical? It almost sounds like a TV show. "Trisha Yearwood has a voice like Pavarotti, except in a different genre." this is not a replay of the 1960's television show "Green Acres." The one where a high cultured woman and her farm-loving husband move from New York city to the country. First of all, anyone who remembers the sitcom's signature song knows TV's Lisa Douglas was not much of a singer. Second, she never warmed to farm life, as Emily Lodine Overgaard has. Farming brought the two together in the first place. Gary Overgaard had just bought a new piece of equipment, a field sprayer. As a thank-you, the sprayer company gave Overgaard and the salesman a free trip to the factory in Denmark. On the airplane, the farmer and the singer found themselves sitting next to each other. Gary Overgaard asked what sort of work she did. "After she told me what she did I just turned to my buddy, the salesman and I said 'I think this is going to be a pretty long boring flight,'" Overgaard said. "Things just took off after that." Instead of boredom, what happened next was seven hours of nearly non-stop conversation. After parting that day, the two kept in touch. Visits followed, and finally marriage. And that is how the opera singer and the farmer found happiness and music on the flatlands of southwest Minnesota. Singing under her professional name of Emily Lodine, she appeared recently with the Northwest Iowa Symphony Orchestra. 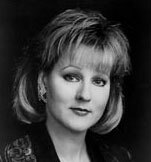 The mezzo soprano has also performed with the Chicago Symphony Orchestra, the Berkshire Opera and the Lyric Opera of Cleveland. Lodine says living in the country has made her work harder. "It gave me a fresh perspective," she says. "It also made me focus a lot harder and keep my contacts up and make my phone calls and not depend so much on my agent to do everything." The marriage of the singer and the farmer produced a new appreciation of different types of music. Gary Overgaard says everyone should see a full scale opera, for its sets, costumes and singing. That's quite a shift from his bachelor days. "The only opry I had was the Grand Ole Opry," he laughs. The opera singer learned a few things too. "I've come to like country western music," she admits. "And I never, in fact not only did I not listen to it I thought it was pretty horrible and hokey and corny. There are a lot of incredible artists, Trisha Yearwood has a voice like Pavarotti, except in a different genre." And there were cultural changes. A self-confessed city kid, Emily went straight from the bustle of urban life to the crisis on the farm. That's not the sort of stuff you heard on "green acres". If there must be a comparison, its probably closer to a radio show, one which sometimes features norwegian bachelor farmers. Gary Overgaard was that bachelor farmer in a past life and Emily Lodine was a city singer. Both are happy with their new lives, music is close by and so is the quiet countryside.